Cetus. © 2003 Torsten Bronger. 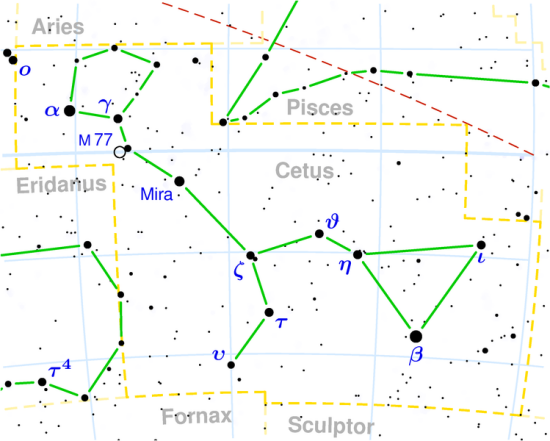 Cetus (abbreviation: Cet), the Whale or Sea Monster, is a very large constellation on the celestial equator, east of Eridanus and south of Aries and Pisces. Cetus contains the important variables Mira and UV Ceti, the prototype UV Ceti star, and the aptly-named Skull Nebula (NGC 246). It is also home to two particularly interesting galaxies. 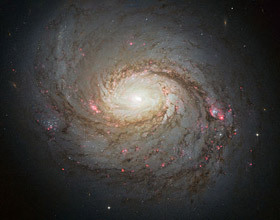 M77 (NGC 1068) is a Seyfert galaxy, seen almost face-on, that lies about 50 million light-years away and 1° southeast of Delta Cet (magnitude 8.8; size 6.9' × 5.9'; R.A. 02h 42.7m, Dec. -00° 01'). NGC 247 is a large, fairly bright spiral galaxy with a compact nucleus (magnitude 8.8; size 20' × 7.4'; R.A. 00h 47.1m, Dec. -20° 46'). M77. Hubble Space Telescope image.